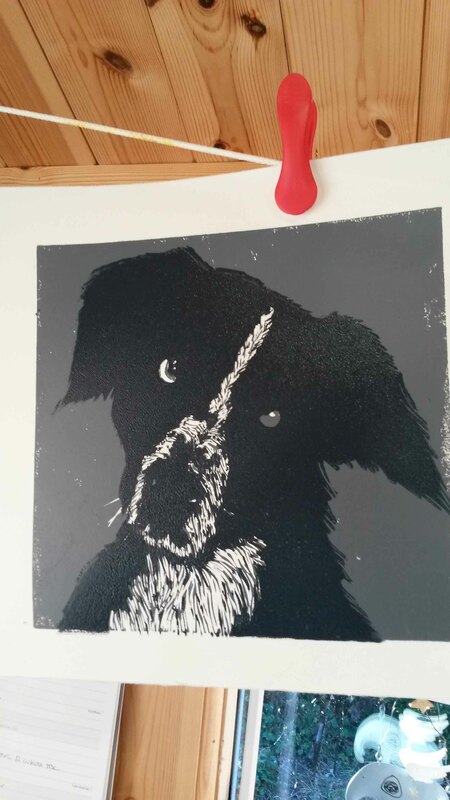 Some time ago (may be as far back as 2012 or 2013) I posted a short tutorial about how to make a simple 3 colour reduction linocut. 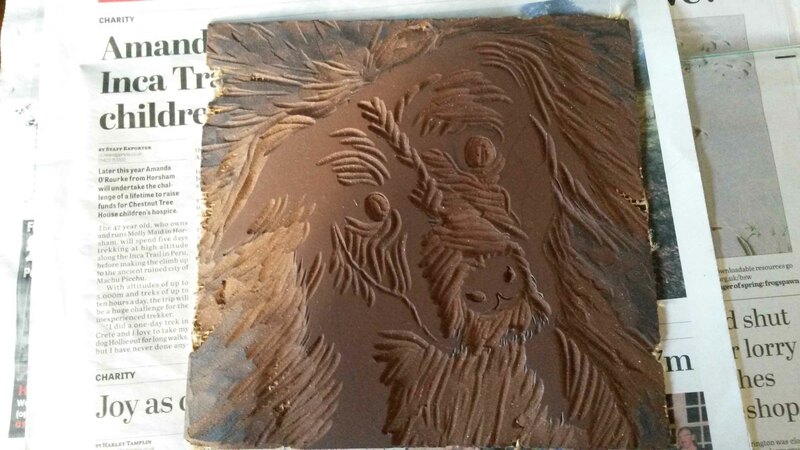 I am going to repeat some of that information here when I explain about how I came to make a linocut of my friends dog – jack. I have a lovely friend, Kate (aka Polly Pincushion – see her blog on WordPress) who always gives the most thoughtful gifts for birthdays and Christmas. As it is her birthday very soon, I wanted to do something extra special and personal because she is such a lovely friend and all round jolly person. 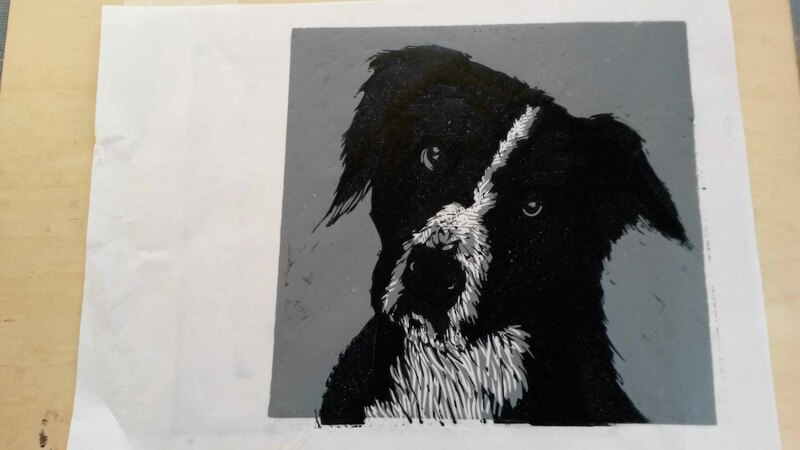 Kate and her partner have a dog, a young Border Collie which they call Jack and he proved to be the source of my inspiration. 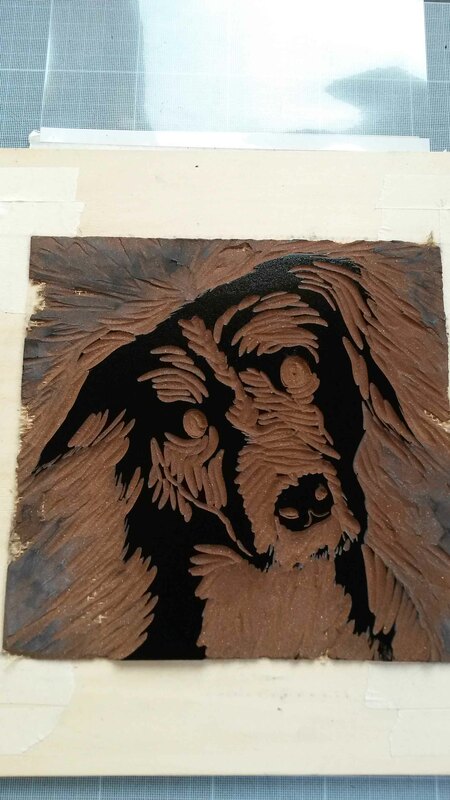 I thought that I could make her a picture of Jack, but in a way that was personal and the medium of linocut seemed to lend itself to this idea. 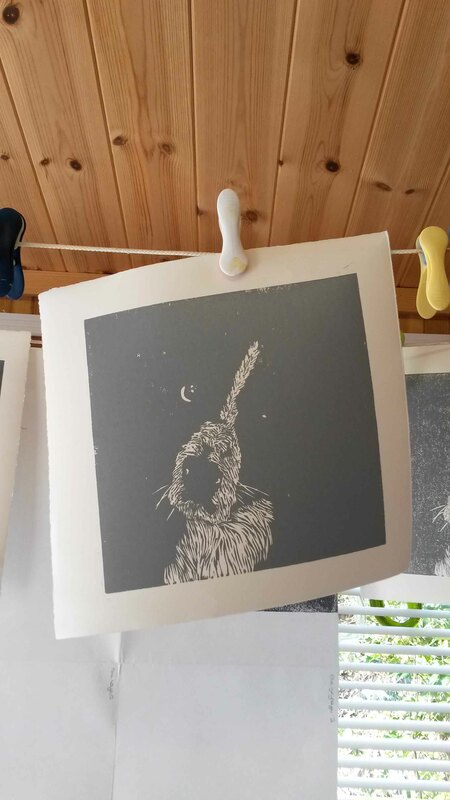 I decided that it should be made in 3 colours and that a reduction lino wold be the best way to do this, partly because it is easier to get the whole image registered (lined up) properly when printing the different colours, and also because this was to be a gift I wanted to make sure that it remained unique and no further copies could be made, other than those made while I was working on it. The first problem was to get a suitable photo of Jack without giving cause for too many questions! In the end, this was easier than I had imagined, so now I was ready. 1. Plan your design and colourways. 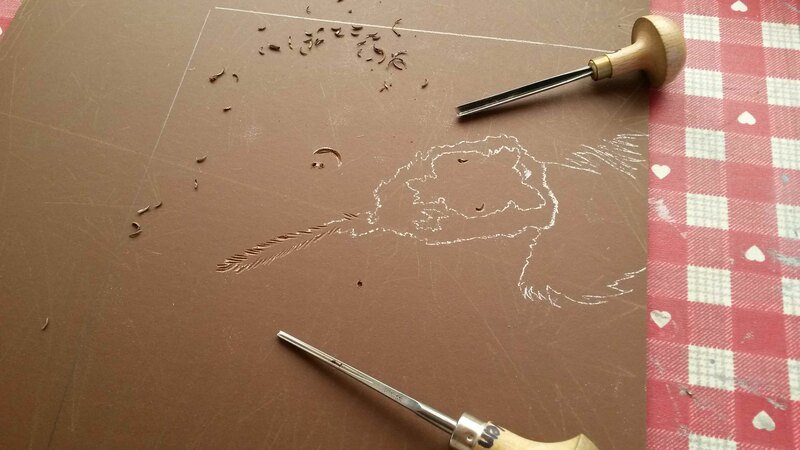 Remember that the lightest colour is always printed first along with any areas which will remain white – these are cut away from the block for the first colourway. 2. 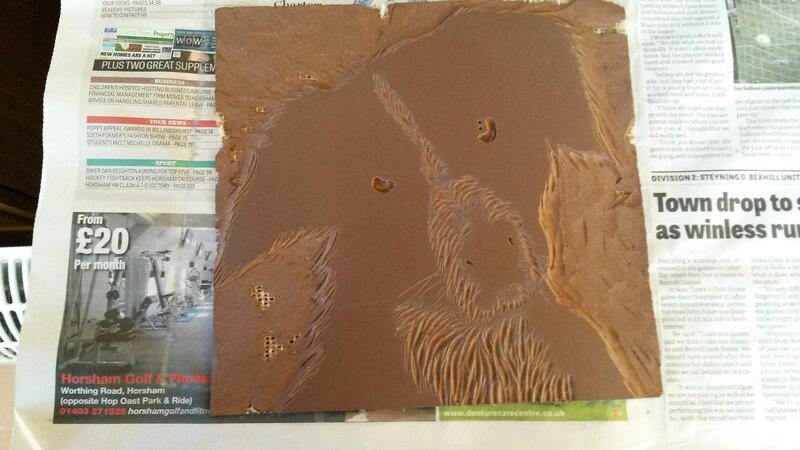 Once the first layer has been cut and printed, decide on which parts will need to be cut away for the second colour. 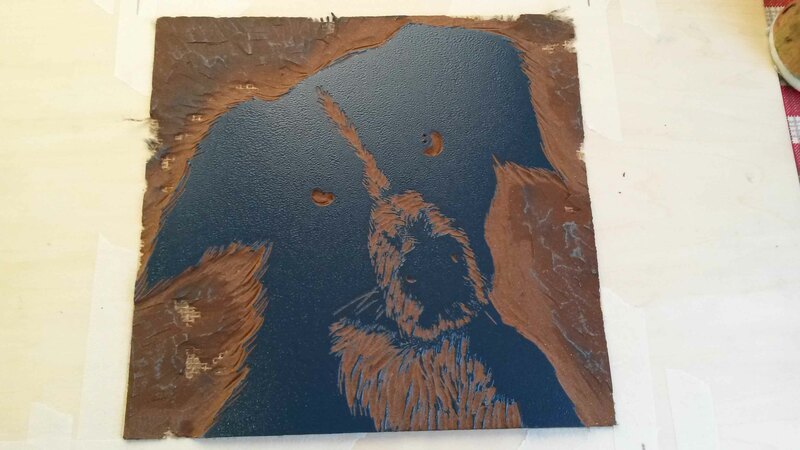 As Jack is a black and white dog, I decided that while I had used grey as the base colour, the main colour for the second layer should be blue. This is because black is rarely absolutely black, and Jack’s coat has a sort of deep blue sheen to it. 3. 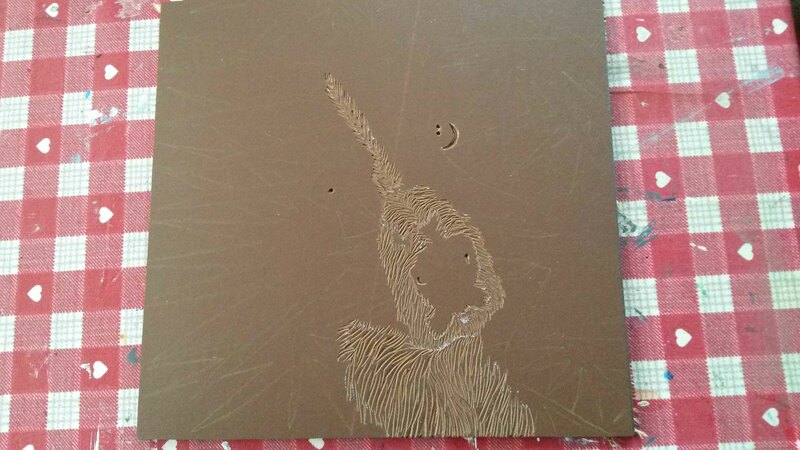 Now it is easy to see how the finished picture will look. 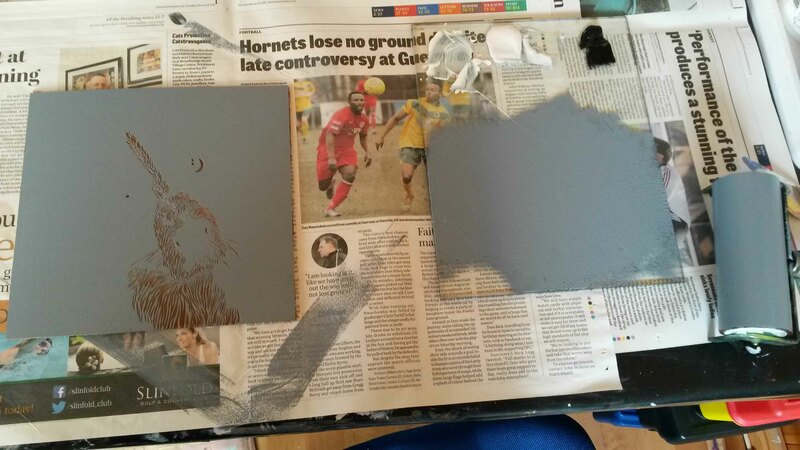 For the final colour I decided on using black, but mainly as a highlight and to define areas which needed more shape. So now the picture is complete and all that is left if to frame it. I chose a simple white frame because I didn’t want to have any distractions from the image. 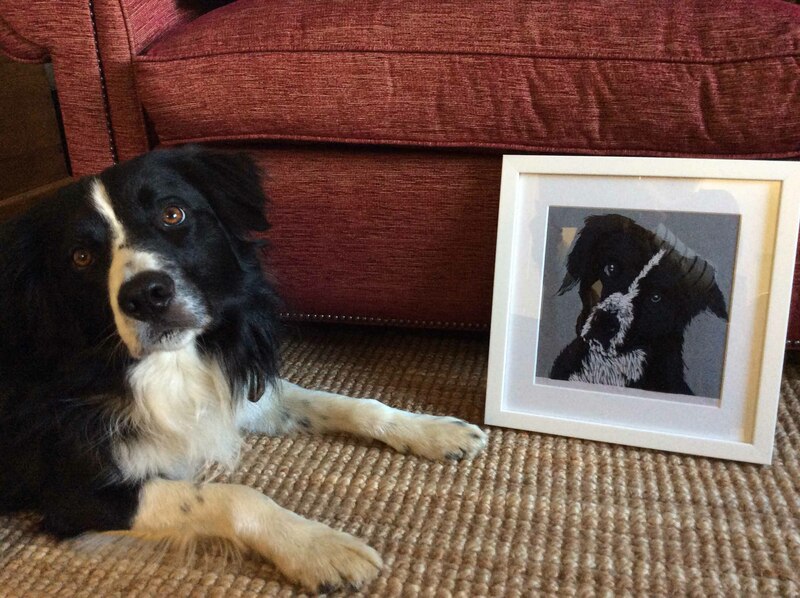 Jack sits with his portrait! This entry was posted in acrylic painting, Art, art and design, drawing, drawing and painting, Fine Art, My Work, oil painting, pencil drawing, photography, printmaking, screen printing, water colour painting and tagged linocut, polly pincushion, relief printmaking. Bookmark the permalink.